The Eastern Washington Section of the American Nuclear Society is committed to encouraging students to enter the field of nuclear science and technology and to advancing the careers of young nuclear professionals. The complete scholarship package must be submitted by 11:59pm PST on April 30, 2016 to be considered. Submissions that are received via mail, or hand delivery will be reviewed at the discretion of the committee. It is strongly encouraged that all packets are submitted electronically here. Applicants must have completed a minimum of two years in an accredited undergraduate program by June 2016 and be enrolled full time in a four-year college or university in the U.S. In addition, graduate students in their first or second year of graduate study, who are enrolled full time, are eligible to apply. Applicants must be planning a career in nuclear science, nuclear engineering or a nuclear-related field. 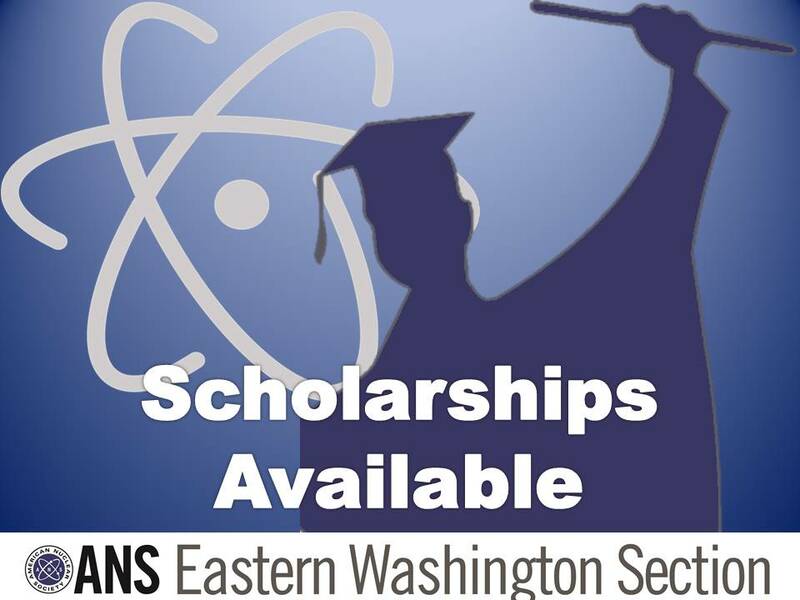 Note that the EWS-ANS chapter scholarships for the most part, are restricted to schools in Washington, Idaho and Oregon, exceptions will be considered on a case by case basis. The Gary Troyer Memorial Scholarship was established to encourage high school graduates to pursue a degree in science, technology, engineering or mathematics (STEM). Applicants must be a 2016 high school graduate in Adams, Asotin, Benton, Columbia, Franklin, Garfield, Grant, Walla Walla, and Whitman County in Washington State. Current high school or home-schooled seniors attending school in the specified counties in eastern Washington. Anticipate completion of high school diploma at the time of application. Plan to pursue a degree in a STEM field at an accredited U.S. post-secondary institution. Have a minimum 3.00 GPA at the end of their junior year of high school. Be active in either Boy Scouts or Girl Scouts during their youth. Pursuing a degree in nuclear science, nuclear engineering or a nuclear-related field. Acceptance to an accredited U.S. post-secondary institution. Recipients of the Eagle Scout award from the Boy Scouts or the Gold Award from the Girl Scouts.